As 2008 comes to a close it’s only natural to take stock of where we’ve been and make plans for where want to end up in the coming year. The past year has presented some incredible global challenges and 2009 doesn’t look to be any easier. 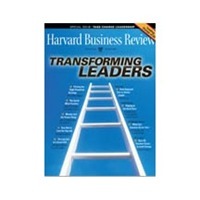 Times like these make leadership skills even more valuable and the January 2009 issue of the Harvard Business is chockful of useful information and ideas for leaders. Themed “Transforming Leaders”, it’s entirely appropriate with a new President moving into the White House on January 20th that this issue addresses many of the challenges and opportunities that new leaders face. If you are a student of leadership you should make sure that you have this issue of the Harvard Business Review for your library. If you can’t wait to see what might be inside here’s a look at some of January’s free web content below. Of course, it’s best to be a subscriber so that you can get great content delivered to your mailbox every month. Tagged with Harvard Business Review.